Autocar is reporting on Swedish supercar maker Koenigsegg’s newest vehicle but details are thin. They’re so thin in fact that the picture above has been copied from a brochure. 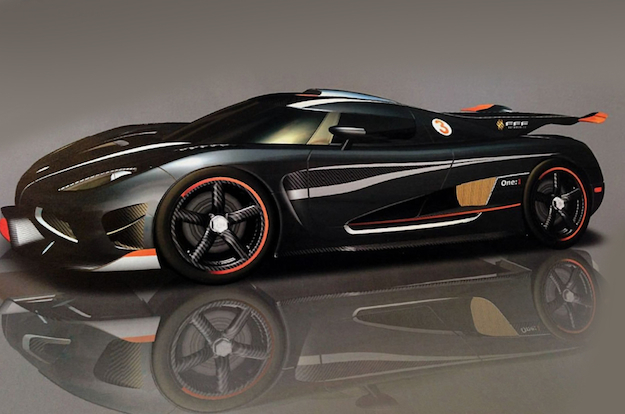 What we do know for sure, however, is that the new Koenigsegg will be called the One:1. While the name doesn’t readily roll off the tongue, it’s essentially a bragging right. The One:1 is rumored to have a curb weight identical to its power output: 1300. So the weight to power ratio will be 1:1. Clever, right? The whole idea behind the One:1 is to unseat the Bugatti Veyron as the fastest production car in the world. It’s current top speed is set at 269.8 MPH. Previous to the Veyron’s introduction the Koenigsegg CCX held the much-coveted title. The Veyron overtook this title from Koenigsegg a few years ago and Koenigsegg has been hot on Bugatti’s tail ever since. Koenigsegg is only expected to build five One:1s and will most likely only sell them in China. Though a few will probably make their way to the the billionaire playgrounds of the Middle East, the United States, and Russia. What if TVs became replaced as the screen of choice for Americans?